Our Portola Rooms are located throughout the property and feature either a King or two Double beds with oversized club chairs, shuttered windows, organic green bath amenities and variety of other personal touches. 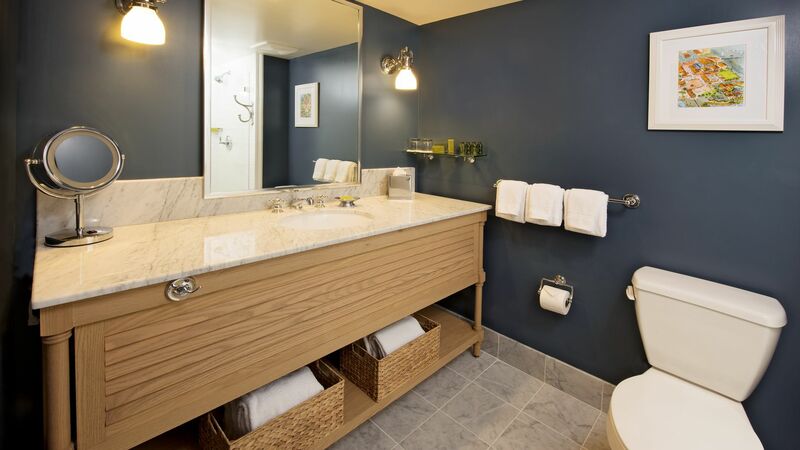 Each of our Monterey Bay accommodations throughout the hotel are carefully designed to meet your every need. Our calming, nautically inspired décor mirrors the mood of Monterey Bay, and each Portola Room is equipped with the highest-quality amenities, including sustainable mattresses made from renewable resources, hypoallergenic pillow toppers, duvets and pillows, 300 thread-count white linens, 42” Energy Star LCD HDTV’s, eco-friendly bath amenities and complimentary Wi-Fi when you book direct. Leave the ordinary behind and embrace ultimate comfort at the Portola Hotel & Spa.